Have you ever been to the grocery store while you were hungry? Grocery store + hunger pains = a lethal combination (for your wallet and jam packed refrigerator, that is). Wait, why are thinking about juicing when you should be thinking about dinner? It’s too late. The carriage is already filled with random, mostly over-priced, Whole Foods items. You’re too hungry to scrutinize the pile of food, so you just hope for the best–a receipt that reads less than $100 and enough ingredients to concoct a simple, healthy dinner. This salad is made up of the various items purchased on my most recent excursion to the grocery store, which was similar to the story described above. In a large bowl, combine the “Curry Lentil” dip with the kale. In other words, massage the kale with the dip. 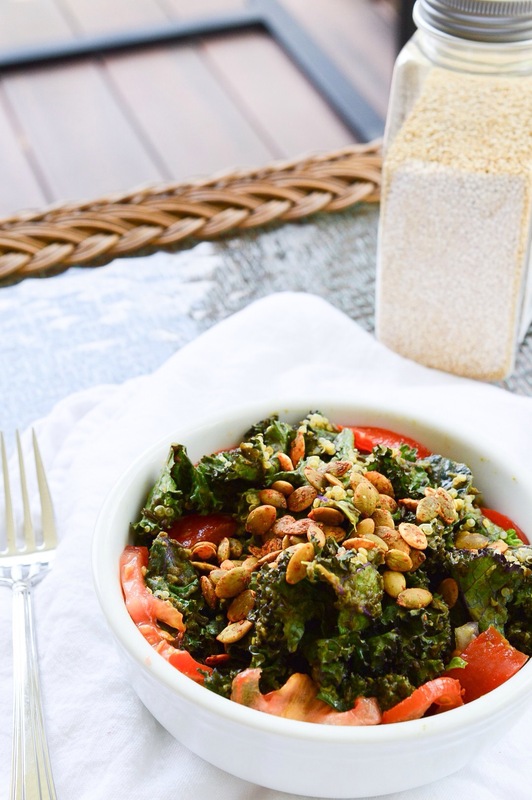 Once the kale is covered with curry lentil goodness, mix in pumpkin seeds, tomato, quinoa, and butternut squash. Enjoy. Lasts 2-3 days in the fridge.